Personal Facts: Alaei is the second-youngest player to reach five WSOP victories in history, behind Allen Cunningham, who was just a few months younger with his 5th win in 2007. When the history of the World Series of Poker is ultimately written, and then re-written again, the name of the champion with the greatest number of wins might not be who you think. Just days after poker legend Phil Hellmuth won his fifth WSOP title (at age 50) here at the 2015 WSOP, another poker player who doesn’t draw nearly the attention nor accolades did something only one other person has done in the 46-year history of the most prestigious poker event on the planet. On Wednesday evening here at the Rio in Las Vegas, Daniel Alaei won his fifth career gold bracelet. The professional poker player from Los Angeles, CA topped a world-class field of 157 players in the $10,000 buy-in Omaha High-Low Split championship, which was played over a three-day period. The total prize pool amounted to $1,475,800, with Alaei taking $391,097 for first place. What makes the win noteworthy, beyond the prestige that goes with any WSOP win, was Alaei’s resume of accomplishments still at a relatively young age. At 30, his fifth win means he’s the second-youngest player in history ever to reach that milestone. Only Allen Cunningham, also with five wins, reached the lofty plateau faster, and that was by only a few months. Alaei’s victory on this date places him into some extraordinary poker company – including other five-time WSOP winners Stu Ungar, Berry Johnston, John Juanda, David Chui, Chris Ferguson, Allen Cunningham, Scotty Nguyen, and Gary “Bones” Berland. By comparison, Hellmuth won his fifth gold bracelet at age 31, which means his all-time wins mark was padded over the next 21 years (9 more wins took place between 1993 and present). Assuming Alaei continues at the current pace, he very well could emerge as the looming challenger to Hellmuth, although Phil Ivey (10 wins at age 39) hopes to be in that discussion. Indeed, Alaei’s accomplishments are even more impressive considering he plays in relatively few tournaments ever year compared to many of his peers. This was his first WSOP tournament entry of 2015. Remarkably, this was also the second time Alaei has won the world championship of Omaha High-Low Split (it’s the highest buy-in such event in the world). He also won back in 2009. Alaei topped a brutally tough final table which included no less than four former gold bracelet winners – including Alaei himself, Scott Clements, Mike Wattel, and Ken Aldridge. In fact, of the 18 players who cashed in this event, 9 had won WSOP gold in the past. 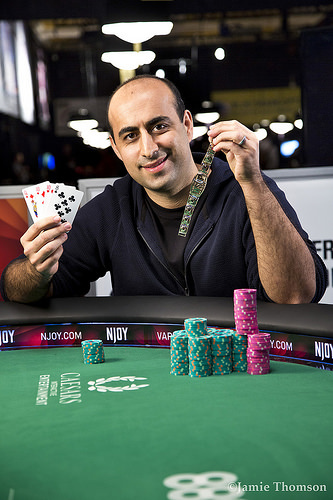 Alaei won the finale by staging a dramatic comeback, arguably the most improbable of any of his five WSOP victories. He was short-stacked several times during the final day, and was out-chipped by more than 6 to 1 when playing heads-up against a formidable challenger named Kyle Maiso, from Scottsdale, AZ. 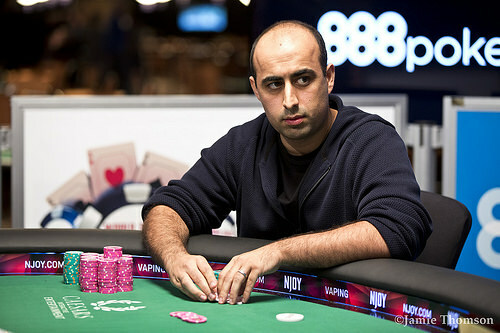 It appeared Maiso would come out on top during much of the finale’s late stages, but Alaei consistently got his chips in with the best of it and scooped enough pots to slowly reverse the chip counts and win the victory, which was streamed live over WSOP.com. Question: Where does this gold bracelet compare to the others you’ve won? Alaei: I hadn’t planned on playing that many tournaments this year. This was my first event to enter, so this was a bit surprising. As far as how this compares, I think they are all pretty sweet. I did win this event in 2009, so it’s nice to win it again. It was especially nice to win since I was so low-stacked when we were heads-up. So, it was really nice to come back and win it. Question: What do you think of your name now being mentioned among some of the true greats of the game? Is that a conversation we should be having now? Alaei: I don’t know. I love coming to the World Series. I love playing the tournaments. I hope to win more, and maybe one day to be in that conversation. As for now, I just try to play my best and do what I do. Question: Can you talk about the heads-up match and the comeback against Kyle Miaso? Alaei: It was a lot of back and forth. I didn’t start out well (going from 1 million down to 500,000). Then, I reversed things and got him where he was down to 500,000, but then he came back again. I just happened to win the last pot. Question: What are your plans the rest of the series? Alaei: I’m thinking of playing (some other $10K events). Question: You seem to prefer alternative games, other than No-Limit Hold’em. Any particular reason why this is so? Alaei: I don’t play any of the No-Limit events. I might play the Main Event or the $10K Six-Max. But I just feel the players are so advanced. I feel like they are much better than me, so I don’t even bother playing in those tournaments. I might play in a few cash games, but that’s it. Second Place: Kyle Miaso, a 31-year-old poker pro from Arizona finished as the runner up. He dominated play late, that is, until Alaei made his heads-up comeback. Nonetheless, with the $241,691 payout as a consolation prize, this was Maiso’s best WSOP finish among his 8 cashes. Third Place: Jeffrey Vaughn, a 58-year-old poker pro from Encino, CA cashed for $175,088 for finishing in third place. He cashed in an event here at the series 19 years ago, finishing in 4th place, which makes this tournament his best career showing, to date. Unfortunately, Vaughn couldn’t keep up with the rising chip counts of either Alaei or Miaso, and went out late on Day Three. Fourth Place: Scott Clements has developed a well-deserved reputation as one of the game’s top Omaha High-Low Split players. He’s won two gold bracelets (2006 and 2007, one in this game) and now has 39 WSOP cashes and 11 final table appearances, including a runner-up finish in this same event back in 2009. Clements, a poker pro from Mount Vernon, WA added $129,235 to his poker bankroll for finishing 4th. His career WSOP earnings now total nearly $2.5 million. Fifth Place: Ken Aldridge, known as “Yellow Jacket” buzzed away with 5th-place prize money, amounting to $97,122. Aldridge, a 67-year-old former school teacher turned part-time semi-pro from North Carolina, won his gold bracelet in a Six-Handed NLHE event back in 2009. This was Aldridge’s best finish since that victory, which moves him over $600,000 in winnings here in Las Vegas. Sixth Place: Anthony Zinno, an attorney from Boston, MA finished in 6th place. He enjoyed his best showing at the series following four deep runs in WSOP Circuit events. Zinno, making his first cash here in 2015, pocketed $74,262 in prize money. Seventh Place: Mike Wattel was one of four gold bracelet winners at the final table. He won his title back in 1999, in this same game. Wattel couldn’t establish any momentum during the finale, and went out with $57,748 in prize money, which makes for nearly $2 million in career winnings at the WSOP. Wattel, a longtime poker pro from the Phoenix area has been playing as a pro for nearly 25 years. This was his 39th in-the-money finish. Eighth Place: Tobias Hausen, from Ockfen, Germany finished in 8th place. His best WSOP showing was worth $45,661. Ninth Place: Gold bracelet winner and former November Niner Jeremy Ausmus finished in 9th place, on the crest of the final table. The 2012 Main Event finalists who finished 5th padded his bankroll with another $36,668 in prize money. This makes for 32 career cashes since 2010, and $3.5 million in career WSOP earnings. Ausmus is 35-years-old and lives in Las Vegas. Other players who cashed in this event aside from those who made the final table included – Joe Cassidy (11th), Gary Benson (16th), Eli Elezra (17th), and Erik Seidel (18th). Omaha High-Low specialist “Prince of Docness” (that’s his real name) cashed in this event, finishing 180h. All six of the Prince’s cashes have been in Omaha-related events. Half of the players who finished in the money, half -- 9 out of 18 -- had won gold bracelets in the past. Kyle Miaso opens the button and Daniel Alaei defends the big blind. Alaei leads the flop and Miaso raises, only to see Alaei put in three bets. Miaso calls all-in for less and the hands are tabled. Kyle Miaso holds and is drawing thing against Alaei's . The on the turn gives Miaso some outs to a low and flush but the locks up the title for Alaei. Kyle Miaso will make just over $240,000 for his runner up finish while Alaei will make just over $390,000 for his fifth World Series of Poker victory. As soon as Kyle Miaso is able to string together a few small pots, Daniel Alaei takes down another pot. On the button, Alaei makes it two bets to go and Miaso calls. The flop is and Miaso checks. Alaei bets and Miaso calls. The turn is the and Miaso checks again. Alaei bets and Miaso calls. On the turn, Miaso checks and Alaei bets. Miaso folds, leaving himself with about 300,000. Daniel Alaei limps the button and Kyle Miaso makes it two bets from the big blind. Alaei calls to see the flop. Miaso leads and Alaei calls, with the same betting pattern occurring after the falls on the turn. Miaso leads for a third time after the falls on the river, with Alaei raising and forcing a fold. Daniel Alaei has again stopped the bleeding and is back to playing a nearly 3:1 chip advantage. Daniel Alaei opens the button and Kyle Miaso calls in the big blind. Miaso leads the turn and Alaei calls to see the river. The completes the board and brings checks from both players, with Miaso tabling for trip jacks. It's good enough to win the pot and Kyle Miaso is now playing just over 1,000,000 chips. Kyle Miaso is down to his final 300,000 chips and opens the button. Daniel Alaei calls. Alaei leads the flop and Miaso calls. The same betting pattern occurs when the falls on the turn, except Miaso calls all-in. He olds the best of it, tabling against Alaei's . The falls on the river and Miaso scoops the pot with two pair, aces and sevens. He's now playing 600,000 and still very short. On the button, Daniel Alaei calls and Kyle Miaso makes it two bets to go. Alaei calls and the flop is . Miaso bets and Alaei calls. The turn is the and Miaso checks. Alaei bets and Miaso raises, making it two bets to go. Alaei calls and the river card is the . Miaso leads out and Alaei raises to two bets. Miaso calls, but Alaei flips for a full house. In disbelief, Miaso mucks his hand saying he had a jack and a flush. Miaso is left with about 300,000. Kyle Miaso opens the button and Daniel Alaei raises from the big blind. Miaso calls to see the flop. Alaei leads and Miaso calls. The brings another bet from Alaei and a fold from Miaso. It's a small pot but it stops the bleeding, if you will, as Miaso is still playing close to 1,400,000 to keep Daniel Alaei's 2:1 heads up advantage. On the button, Kyle Miaso makes it two bets to go. Daniel Alaei calls and the flop is . Alaei leads out and Miaso raises. Instead of calling, Alaei makes it three bets to go and Miaso calls. The is the turn and Alaei checks. Miaso bets and Alaei calls. The river card is the and Alaei checks. Miaso bets and Alaei folds. With the pot, Miaso is up to 1.5 million. Down to about 500,000 at one point, Kyle Miaso is slowly rebuilding his stack. On the button, Miaso makes it two bets to go. Daniel Alaei calls and the flop is . Alaei checks and Miaso bets. Alaei calls and the turn is the . Once again, Alaei checks and Miaso bets. Alaei calls and the is the river. This time Alaei check-folds to a bet from Miaso and Miaso is now up to 1.1 million. Daniel Alaei limps and Kyle Miaso makes it two bets from the big blind. Alaei calls to see the flop. Miaso then leads, with Alaei quickly calling. The same betting pattern occurs as the falls on the river and the completes the board. Miaso tables which is good enough to scoop the pot. Kyle Miaso is now playing 900,000 while Daniel Alaei is playing 3,800,000. Kyle Miaso opens the button and Daniel Alaei defends his big blind. Alaei check-raises the flop and then leads when the falls on the turn. It's Miaso's turn to raise. Alaei calls and then leads for second time after the completes the board. Alaei tables for a set of threes and a low. Kyle Miaso flashes his cards to his rail before mucking. He's now left with just over 500,000 and is now playing just a few big bets with a half hour to go in Level 28. Daniel Alaei limps the button and Kyle Miaso checks his option. The flop falls and Miaso check-raises. Alaei calls. The comes on the turn and Miaso leads, with Alaei calling to see the river. The completes the board and Miaso check calls, only to see Alaei table for a rivered full house. Miaso mucks and is now down below the 1,000,000 chip mark for the first time in recent memory. In the past four hands, Daniel Alaei has stormed ahead on Kyle Miaso, assuming the chip lead. Alaei calls the big blind and Miaso checks his option. The flop is and Miaso bets. Alaei raises and Miaso calls. The turn is and Miaso checks. Alaei bets and Miaso calls. On the river, Miaso checks and Alaei bets. After thinking, Miaso calls and Alaei turns over for the nut flush. Alaei is now up to 3.3 million. Kyle Miaso opens the button and Daniel Alaei makes it three bets from the big blind. Miaso calls. The betting action on the flop and turn is the same, with Alaei leading and Miaso calling as the board runs out . Alaei leads for a third time after the falls on the river, only to see Miaso raise. Alaei calls and tables for the nut low. Miaso tables for a full house. The players chop the pot, making it the first pot that hasn't been scooped in some time. Kyle Miaso opens the button and Daniel Alaei calls. Both players check the flop, with Alaei leading when the falls on the turn. Miaso calls and the same betting pattern occurs after the completes the board. Daniel Alaei tables for a full house, which is good enough to scoop the pot and move him close to the 2,000,000 chip mark. Kyle Miaso opens to two bets on the button and Daniel Alaei calls. The flop is and Alaei checks. Miaso bets and Alaei raises, making it two bets to go. Miaso calls and the turn is the . Alaei bets and Miaso calls. On the river, Alaei bets and Miaso calls. Alaei tables to scoop the pot with trip kings. After seeing his stack dwindle to under a million, Alaei is now at 1.6 million. Daniel Alaei opens the button and Kyle Miaso defends his big blind. Miaso check-raises the flop, with Alaei calling to see the turn. The brings a lead bet from Miaso and a call from Alaei. The same betting pattern continues after the completes the board, with Miaso tabling . It's good enough to scoop the pot and Daniel Alaei is now playing just under 600,000 with Kyle Miaso controlling close to 4,100,000 chips.